Following the first World War women’s fashions underwent a drastic change. Gone were the conventions of the pre-war and Victorian eras; a new age had begun. Aside from the changes in clothing, hair and jewelry styles, women began to adopt a more noticeable style of make-up than was previously customary. Cosmetics, once disapproved of by “polite” society, were now acceptable and women decided it was necessary to carry their cosmetics with them as they went about their day. 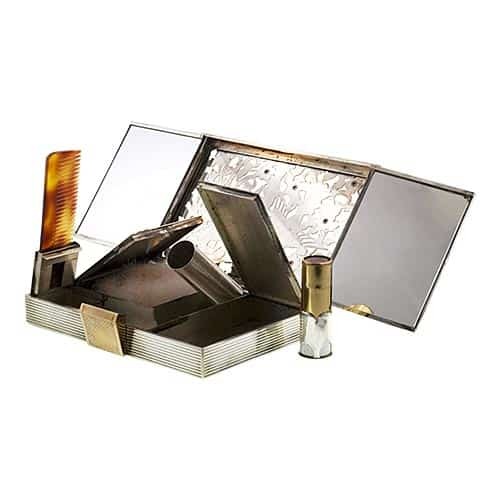 Jeweled compacts, lipstick holders, and vanity cases were now “must have” items for the well-appointed woman. A vanity case (also known by its French name minaudière) is a small box or other container designed to decoratively carry a woman’s cosmetics. They can be as simple as a compact or a compact and lipstick combination or as elaborate as a box designed to hold powder, lipstick, rouge, perfume, cigarettes, etc. Usually, vanity cases are small enough to be slipped into a handbag, but in the 1930’s and 40’s they were often designed to be carried alone, substituting for an evening clutch. These vanity cases were usually rigid and, at the upper end of the spectrum, made of precious metals, decorated by engraving, piercework, gemstones, enamel and other such jewelry techniques. An attached chain and finger ring or bracelet was sometimes added as a safety feature to ensure against loss of the often extravagant and expensive boxes. They were often accompanied by a satin or leather protective pouch.